The Cistercian Abbey of Netley was founded in the 13th century the by Bishop of Winchester, Peter des Roches. It was converted into a private residence for Sir William Paulet after the dissolution of religious houses. 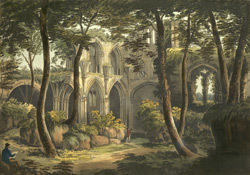 It declined slowly in ruin, and its crumbling remains were romanticised by 18th-century writers and poets, Thomas Gray and Horace Walpole, and by amateur artists (in the bottom right hand corner of this image, for instance, a man is pictured sketching the scene).